Ideal for automated assembly lines marking tires, auto parts or general manufactured goods. The Stlotube was developed in Europe and now owned by Markal. Use the Stylotube for horizontal automated marking. Stylotube is designed for use with RS 2000 and RS 1000 cartridges. Works on metal, rubber, plastic, cloth. 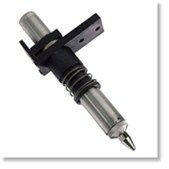 Require steel marking tips and paint cartridges. See under other related products. Markal Stylotube Replacement Tips in 2mm, 3mm or 6mm. Box of 5. Long lasting replacement marking tips for the Stylotube marking system. Box of 5. Clean and reuse.